Born in 1917, Edith Bouvier Beale, or as she was better known, Little Edie, was a dancer, socialite and cousin to Jackie Kennedy. 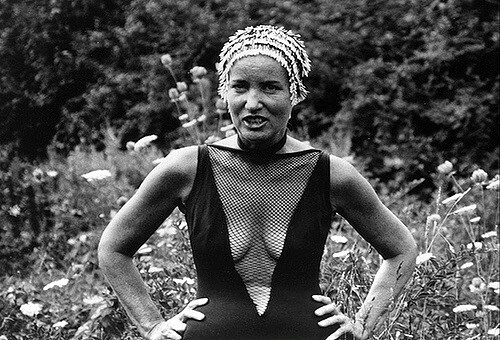 However, she is most famous for the documentary Grey Gardens, which featured her and her mother, known as Big Edie, living in a decaying mansion in the Hamptons, in isolation and eventually poverty. The documentary has gone on to inspire a 2006 musical and a 2009 film starring Jessica Lange and Drew Barrymore. While the documentary made the mother and daughter duo famous, it wasn’t until years after Little Edie’s death, in 2002, that she became recognised as a fashion icon, and her quirky, unique style was at last appreciated. Little Edie is known for her style eccentricities; prompted by losing her hair due to alopecia, headscarves quickly became Edie’s defining accessory. While they varied in texture and colour, they were usually worn with a brooch either under her chin or right on top of her head. The headscarf is the signature aspect of Little Edie’s style, and she was never seen without one in her later years. Other signature trademarks of hers included red lipstick, fur coats and one-piece swimming costumes, which are all accents easy to imitate. However, some aspects of her style are less easy to replicate for everyday wear. Little Edie made her own clothes from old tablecloths and curtains, and was known for draping and layering multiple pieces, while clashing print and pattern. She would wear skirts upside down or worn as capes, or would wear towels on her head rather than her usual silk headscarf. Little Edie pushed the boundaries of what was ‘normal,’ which resulted in her iconic, unique style. It’s this style that has inspired fashion editorials in Italian and Spanish Vogue, and has influenced designers like Marc Jacobs and Tommy Ton. It would be nice to think that Little Edie was aware of how influential her style would someday become, especially after the dismissal she faced during her lifetime, and that people would even come to attempt to imitate her quirky outfits.